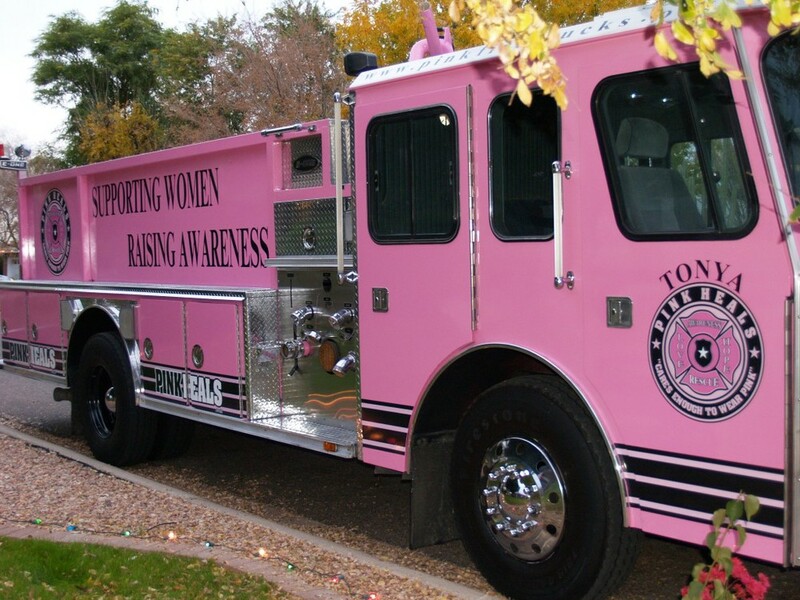 Easy to host the tour and easy to start Pink Heals in a community. Sign up for our newsletter and stay up to date on tour info and events around the country. We put our volunteerism and our labor of love to work for the people in your community. According to our mission the money raised by your community efforts, be it individuals, public servants, or local businesses, should stay local - in your community, county or state. Pink Heals is health care support at a grass roots level and visionary leaders across the country are implementing Pink Heals at a rapid pace. 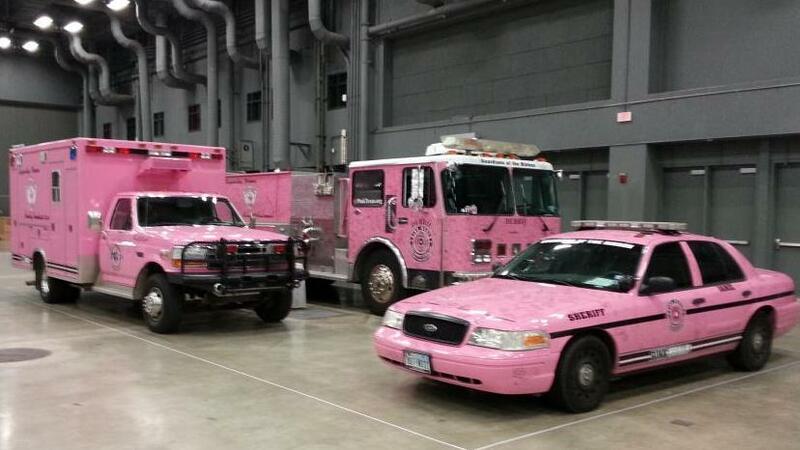 Pink Heals is a program that partners with Public Safety, local businesses and families to bring a community together. It is a program that provides home visits to show individuals that they are loved, cherished and important to others. 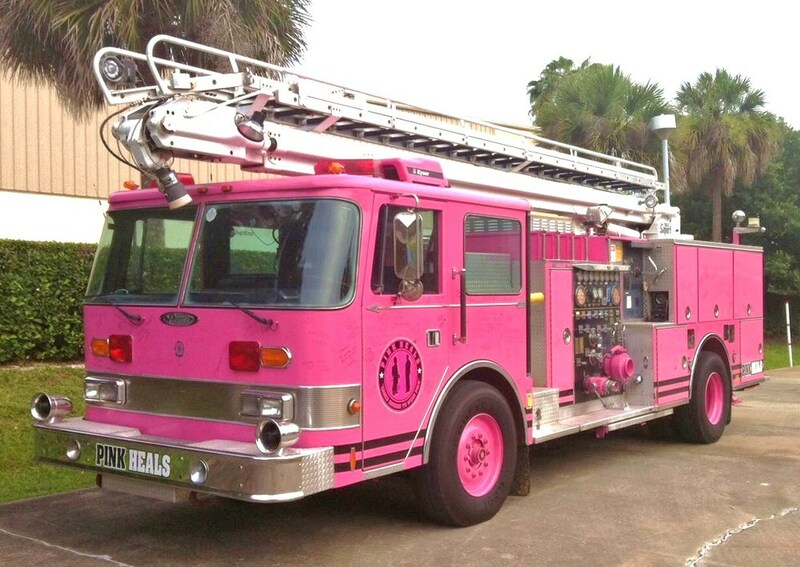 Pink Heals brings back the human element by celebrating people, not causes. Contact us to get our program started in your community! 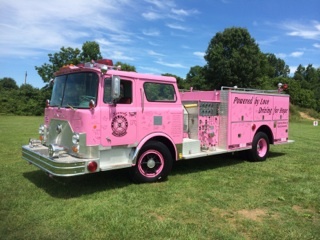 The Pink Heals National Tour operates by the sale of merchandise, gifts, local sponsorship and in kind donations to maintain our vehicles, buy gas and travel across the country to visit individuals and share the program. 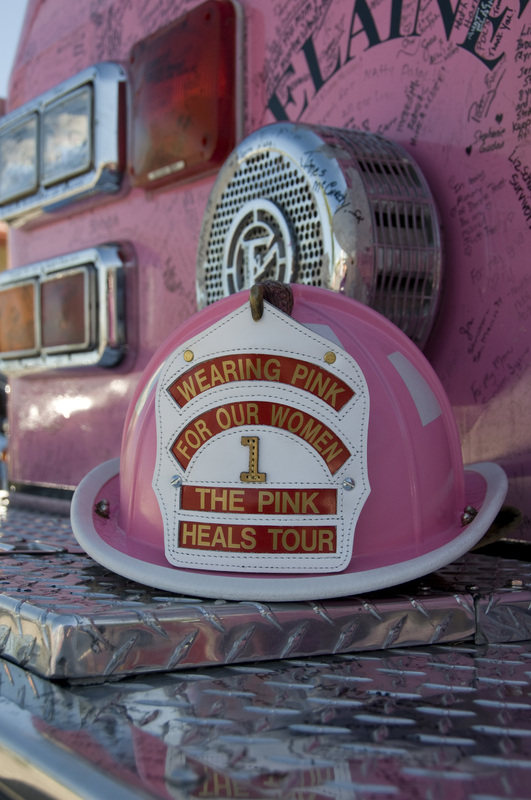 Tour drivers volunteer up to 21 days at a time to drive pink fire trucks and police cars across America and deliver the Pink Heals Program to communities. 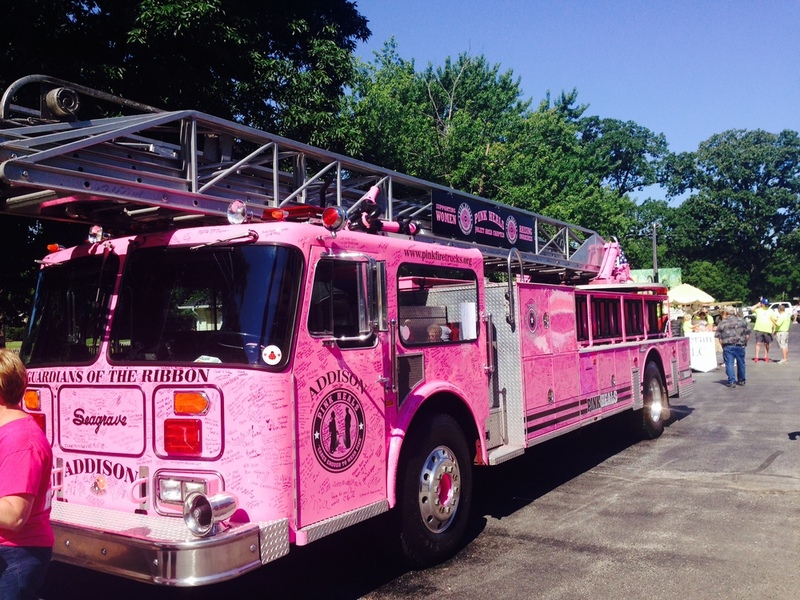 Our local chapters use pink fire trucks and police cars as a visual reminder that people matter. Chapters partner with local businesses for home visits in order to provide visit recipients with donated goods, gift cards and services and to give the employees of those businesses the opportunity to bring joy, love and hope to people in need. To provide communities with a program that supports people in need on a personal level in partnership with public safety and local businesses. “Karen” with Karen our first truck! A woman to whom I owe a most special "Thank You" for believing in me (Dave Graybill) and the vision of this initiative, Pink Heals. We are focused on our charity’s ability to bring about long lasting and meaningful change in the lives of people and communities by helping to create immediate funds through tax based organizations such as but not limited to our first line of defense The Fire and Police Forces. *ALL Chapters Tax Exempt Status is Pending. See your tax professional regarding donations. Disclaimer: The National Organization of Guardians of the Ribbon/Pink Heals Tour operates sovereign and independently from it’s chapters. Pink Heals Chapters across The United States and Canada operate independently and as their own legal entity. Each individual chapter operates business and events under the supervision of their own elected board (President, Vice President, Secretary, and Treasurer) and a board of directors. Each individual chapter which carries the words “Pink Heals or Guardians of the Ribbon” within its business title is solely responsible for day to day operations, proper documentation of finances, and record keeping. We associate our Mission Statement, Articles of Association and Bylaws to act in accordance with each Chapter’s state and local laws. The National Organization of Guardians of the Ribbon Pink Heals Tour requires all chapters’ to operate ethically, honestly, and with transparency. A chapter which fails to operate ethically, honestly, and with transparency will constitute formal reprimand and will be issued a Cease and Desist order from the National Organization. Dave Graybill is an entrepreneur, philanthropist, author, former athlete and retired fire fighter. He is a visionary man who has made it his life’s passion to partner with public safety and local businesses to give back to the community. His philanthropy began in 2003 when he organized sponsors and spent five months hitting a golf ball across America to raise money for sick children. It further evolved in 2007 when he formed the non-profit, Pink Heals. His idea to bring public safety officers together to fund raise and keep the money in their own community has grown exponentially. The program repurposes fire trucks and other public safety vehicles in order to make home visits to people in need and support fund raising efforts at a local level. Individuals and businesses who use the Pink Heals program for fund raising are encouraged to keep the money local to support community members, local non profits and neighborhood initiatives. 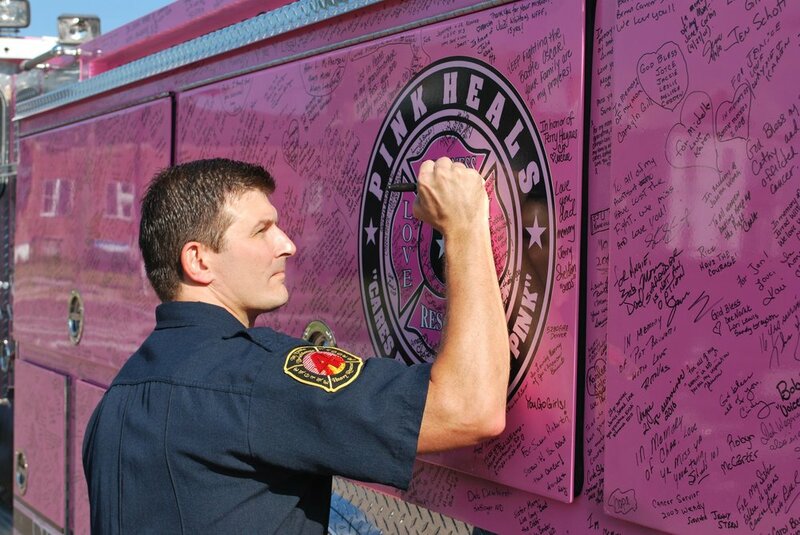 Over the past ten years Dave has evolved the Pink Heals program from a single fire truck driven solely by him to dozens of vehicles in 2 countries driven by hundreds of volunteers. As a result of Dave’s visionary leadership the Pink Heals program is driving much needed support for a wide range of community based initiatives all over the World. The National Organization of Pink Heals Inc./Pink Heals Tour operates sovereign and independently from it’s chapters. Pink Heals Chapters across The United States and Canada operate independently and as their own legal entity. Each individual chapter operates business and events under the supervision of their own elected board (President, Vice President, Secretary, and Treasurer) and a board of directors. The National Organization of Pink Heals Inc./Pink Heals Tour requires all chapters to operate ethically, honestly, and with transparency. A chapter which fails to operate ethically, honestly, and with transparency will constitute formal reprimand and will be issued a Cease and Desist order from the National Organization.